Giles Tremlett, the Guardian One Spanish business has hit upon a novel update to an old idea to bypass the country’s banking crisis – a mattress in which you can stash your hard-earned eurosMy Mattress Savings BankMy Mattress Savings Bank features a safe hidden among the bed springs. Is your money safe in the bank? Obviously not if you deposited large sums in Cyprus – where the decision to raid savings accounts has rung alarm bells in other countries teetering on the bank bailout high-wire. But what else can you do with those hard-earned pounds, euros or – for Russian tax-dodgers and mafiosi – roubles? Stuffing them under the floorboards or your mattress is hardly a secure option. Step forward La Caja de Ahorros Mi Colchón, My Mattress Savings Bank, a novel Spanish business that provides you with a mattress that has a safe hidden inside the springs. A few months ago the company’s founder, Paco Santos, saw his bespoke mattress company in the small western town of Santa Marta de Tormes heading the same way as many small businesses in a recession-plagued country with 26% unemployment. With scared consumers keeping purses tightly zipped, sales had dried up and companies were folding. «Sales in the slumber sector are down more than 50%,» he explains. At the same time, hundreds of thousands of angry Spanish small savers were taking to the streets. Why? Because they had invested in the country’s dodgy cajas, or savings banks. Last weekend, the worst was confirmed: 350,000 small savers who each bought €6,000 in shares in the rescued Bankia bank were cleaned out as their shares’ value fell close to zero. A further 300,000 people who bought complex, often unintelligible, products from cajas that eventually needed a joint €40bn European bailout saw their savings shaved by so-called «haircuts» of 30-60%. «Banks are in the headlines now because of Cyprus, but in Spain we have known how dangerous they can be for several years,» says Santos. «People were starting to say it was better to keep it under your mattress». At the urging of advertising company VCCP Madrid, providing free help under a scheme to stop small businesses from folding, Santos explored the idea of helping people to do exactly that – by adding safes to mattresses. A tongue-in-cheek advertisement encouraged suspicious punters to avoid bank charges and «keep your money close – and far from the banks». Wilier Spaniards may also have seen a system for dodging the tax man. Either way, the mattress safe has saved Santos’s business. The first 20 sold out within 24 hours. He refuses to give figures for orders, but admits these will keep him going for several months at least. Security firms are also showing interest. And export enquiries have come from companies trading with Chile, Mexico and – inevitably – Cyprus. 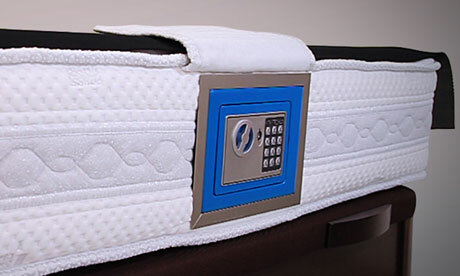 Santos claims that by putting the safes at the end of the mattress, customers snooze just as comfortably as on a normal bed. He also admits that, as a bank, a mattress has certain disadvantages. It does not hand out credit cards or overdrafts and it will not lend you money. But in credit-crunched Spain, your high-street bank probably will not lend you anything anyway. As Cypriot banks finally opened their doors again yesterday, and while German chancellor Angela Merkel presses for savers (rather than her own taxpayers) to fund bank rescues around Europe, punters in countries such as Spain, Italy, Greece and Portugal may find Santos’s message irresistible: invest wisely – stick it in your mattress. Greeks and opposition parties inspired by the Cypriot rejection of an unpopular bailout deal urged Athens on Wednesday to stand up to foreign lenders whose demands have resulted in repeated rounds of austerity that have made Greek life a misery. Cyprus’s parliament on Tuesday rejected a levy on bank deposits demanded in return for aid, raising the specter of a default for the island nation that could mean enduring wave after wave of spending cuts and tax rises, just like Greece. Cyprus pleaded with Russia on Wednesday for a five-year extension and lower interest on an existing 2.5 billion euro ($3.22 billion) loan and 5 billion euros in new loans after voting down a euro zone plan for a 10 billion euro bailout. «The Cypriots set an example to follow,» left-leaning Eleftherotypia said in its leading editorial. «How can the Cypriots say ‘no’ and we can’t even reject a single property tax?», ran a headline on Greek television channel Antenna. Greece, which first sought aid from European Union and the International Monetary Fund in 2010, has yielded to demands for harsh austerity measures that have slashed household income by almost a third and sent unemployment up to a record 26 percent. The «no» vote from Nicosia comes just days before Athens and its lenders resume delicate talks on the implementation of the country’s bailout, with creditors pushing Athens to respect past pledges to fire civil servants and stick to unpopular tax rises. Whether Athens – which in the past has ignored riots and mass protests to approve austerity packages and avert bankruptcy – will be swayed by the latest outcry depends on whether Cyprus ends up bankrupt or finds a solution elsewhere, analysts said. «If Cyprus goes bankrupt, then the government’s argument that we must stay on the austerity path will be reinforced, but if it wins better bailout terms the main opposition’s arguments will be stronger,» said Thomas Gerakis, head of Marc pollsters. Prime Minister Antonis Samaras’s government – which has been scrambling to assure Greeks that their bank deposits are not at risk due to the Cypriot crisis – said late on Tuesday it supported Cyprus’s choices. But Greece’s anti-bailout opposition, including the radical leftist Syriza party, rushed to accuse him and Finance Minister Yiannis Stournaras of bowing to the austerity demands of German Chancellor Angela Merkel. «After the Cypriots’ proud ‘no’, Mr. Samaras and Mr. Stournaras are the most faithful adherents of Ms. Merkel’s strategy,» said a statement from Syriza, Greece’s most popular party according to a MARC/Alpha survey published on Tuesday. Syriza also interpreted a statement late on Tuesday by the European Central Bank to continue funding Cypriot banks within existing rules, as a sign of weakness on the part of creditors. «And just like that, we found out that another way is possible,» Syriza deputy Rena Dourou tweeted a few minutes after the ECB statement was released. – Απολυτήριο γυμνασίου στα… 106 και σεξουαλική διαπαιδαγώγηση στα… πέντε! «Τα Υπ’ Όψιν» είναι η εκπομπή (podcast)μας στο νέο, ιντερνετικό ραδιόφωνο που μπορείτε να ακούσετε όλο το εικοσιτετράωρο, όλη την εβδομάδα από τον υπολογιστή και το τηλέφωνό σας: κάντε κλικ στην ηλεκτρονική διεύθυνση, επιλέξτε με ασφάλεια τo φορμάτ mp3 στο Google και το ιντερνετικό ραδιόφωνο είναι στη διάθεσή σας , όσες φορές και όποτε ταιριάζει στο πρόγραμμά σας! Για πληροφόρηση, συζήτηση και πολλή μουσική!